The ties between Manchester and China have always been particularly strong. The rebuilding of the city's industries after World War Two spurred a massive influx of immigration from China in the late 1940s. 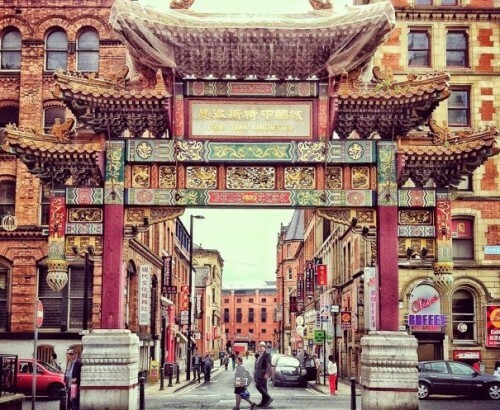 In fact, Manchester now hosts the largest Chinese population in Europe, and as the second largest Chinatown in the United Kingdom after London, Manchester’s Chinatown has plenty to offer visitors: Chinese, as well as Japanese, Nepalese, Vietnamese, Malaysian, Singaporean and Thai food. The iconic archway on Faulkner Street was completed in 1987 as a gift from the Chinese people. It’s currently the only such arch in Europe, and even more decorative than the one in San Francisco, with its design in ceramic, lacquer, paint and gold leaf. Pedestrians can also relax in the ornamental gardens flanking the gate after a day spent shopping in one of Chinatown’s many giftshops, supermarkets or medicine shops. In the 1970s, one could even visit a local Hong Kong government office. Manchester’s first Chinese restaurant was the Ping Hong in Mosley Street, which opened 1948. By the 1960s, the rapid growth of the Chinese population had expanded this number to 16. From there, the area has been a centre of Chinese cuisine in the city. Szechuan restaurants Red Chilli and Red N Hot come highly recommended by Manchester’s foodie scene. For those with a sweet tooth, Ho’s Bakery on 46 Faulkner Street bakes up some brilliant egg tarts and cream buns. The Yang Sing is also worth a look, as the purported “best Chinese restaurant in Europe”. The Chinese Arts Centre, established in 1986 by a group of British Chinese artists, celebrates Chinese culture in British media. The centre expanded into travelling exhibitions in 1999, and since then has put on shows throughout Europe in partnership with other organisations. 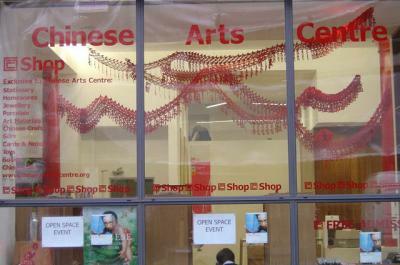 Chinese New Year in particular is a good time of year to visit Manchester’s Chinatown. The neighbourhood celebrates in style, including fireworks, displays, acrobats and dancers, and of course plenty of great food. There’s also a parade featuring a 175ft paper dragon weaving its way from Albert Square to Chinatown, which attracted 70,000 onlookers in 2012. For those wanting to explore this unique part of the city, Chinatown is just a short walk away from a number of Metrolink stations, including Mosley Street, Piccadilly Cardens and St. Peter’s Square. There are a number of hotels in Manchester close by, making it a great area for out of towners to check out too.